I won this from Goodreads. This was not exactly how I expected it would be. Starting this novel, for me, was very hard to do. Don't get me wrong, I like dark and twisted thinking, but this book started out even darker and more twisted than my personal taste allows. Even though it was a rough start, I will tell you that it's not what you would expect. Don't give up just yet! This is a coming of age novel about Damon, who gets kicked out of school for his anger, on his 18th birthday, no less. He goes home and gets even more depressed as he wallows in his anger, until something happens. He finds out from his friend Moe that the Pigman has a job opening. Everyone is afraid of the Pigman and Damon thinks that if he gets to work for Mr. Pigman, he will become braver AND learn how to shoot guns. What he doesn't expect is the friendship that develops between them and how much the Pigman and Damon help each other in the process. I do recommend this book, but with a strong warning that it is not for younger teens. Amazing turn of events and even more amazing is the way the novel turns from dark and destitute to one of unexpected kindness. Kudos to you Burke! 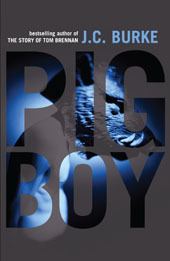 Sign into Goodreads to see if any of your friends have read Pig Boy.